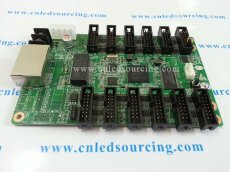 RV908T LED receiver card is the newest version of Linsn RV908, which is same as RV908H. It is specifically designed for those LED display manufacturers with standardization in the industry. Free of hub card design, compared to RV908, RV908T/H has the following advantages. 1. Cost effective: on-board monitoring, no extra monitoring card needed. 2. Multi-function: to carry pixels of LED screen and monitor the LED screen working status, preventing safety issue and extend lifetime of usage. 1. Temperature: integrated on board, working range:-80℃-125℃. 3. Humidity:Need humidity sensor, to detect humidity condition. 5. Cabinet door open/closed detection:need touch sensor installed on cabinet door. With this function, protect receiving card, power supply and LED PCB from rain, sunlight, etc. 6. Three voltage surveillance: two for cabinet power, one for receiving card. 7. Email Alert: alert with real time status of reach receiving card. Very good service! Thank you for your help. Fast delivery, nice seller! Thanks again.